MAGNIFICO APARTAMENTO EN PRIMERA LINEA DE PLAYA CON TERRAZA-SOLARIUM DE 50 M2, MUY CERCA DEL CASCO ANTIGUO DE PEÑISCOLA. VISTAS INCREÍBLES AL MAR Y AL CASTILLO DEL PAPA LUNA. WI-FI Y APARCAMIENTO GRATUITOS. EL APARTAMENTO DISPONE DE ROPA DE CAMA Y TOALLAS. COCINA TOTALMENTE EQUIPADA CON NEVERA, HORNO, MICROONDAS Y LAVADORA. BAÑO RECIÉN REFORMADO . This property, with incredible views, is 1 minute walk from the beach. Set 600 m from Peñiscola Castle and 9 km from Parque natural de la Serra d'Irta. Guests benefit from free WiFi and private parking available on site. The unit is equipped with a kitchen. Towels and bed linen are offered in this self-catering accommodation. Other facilities include a sun terrace of 50 m2. The nearest airport is Castellon Airport, 34 km from the property. Es un apartamento único, por su gran terraza, magnificas vistas, frente a la playa, situación cercana al casco urbano, parking incluido, recién reformado. No encontrarás otro igual. TAMBIEN TIENE DOS MESAS DE COMEDOR EN LA TERRAZA CON 4 SILLAS CADA UNA. Angenehmer, netter Vermieter. Gut eingerichtete Wohnung mit wunderschönem Ausblick auf Peniscola, Strand und den Sonnenaufgang. Zugang zum gedeckten Parkplatz mittels Schranken. Strand über die Strasse erreichbar. Zentrum von Peniscola gut per Fuss oder öffentlichem Bus erreichbar. Sind sehr zufrieden und können uns weitere Aufenthalte vorstellen. Appartement très agréable, bien équipé, joliment décoré, très bien situé, tout se fait à pied et bien sûr une vue magnifique. Nous le recommendons ! 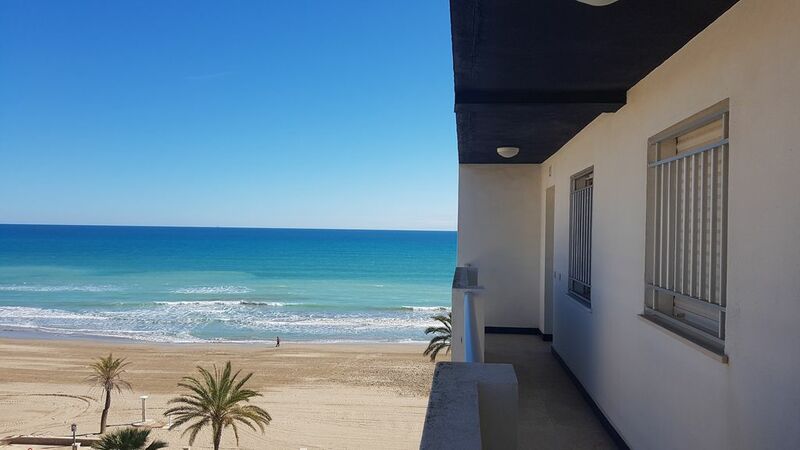 A wonderful apartment on a front line location in Peniscola.Very private directly viewing the beach. The apartment was well appionted with new bathroom , well fitted kitchen ,and fabulous spacious balcony.